I am a big art supporter. I love theater….kids theater, community theater and professional theater. The visual arts are delightful. Ceramics, photography, water colors, oils, jewelry…..I am amazed at the talent people have. So I am thrilled to see the Downtown Mesa Association and NEDCO bringing an art installation to downtown Mesa. I hope Mesa will continue in this path and make Mesa a hub for art of all kinds. The Downtown Mesa Association and NEDCO have teamed up to bring the IN FLUX project, a temporary art installation that is meant to add color and vibrancy to downtown areas, to Main Street in Downtown Mesa, according to a press release. “Downtown Mesa is becoming a hub for arts and culture and a real maker’s place where artists come to create and showcase their work. This installation is a great reflection on the direction Downtown is headed and we are excited to be featuring pieces on a number of storefronts on Main Street,” David Short, executive director of the Downtown Mesa Association, said in the release. The IN FLUX initiative, operated through the strategic partnership of 11 organizations in Chandler, Glendale, Gilbert, Mesa, Phoenix, Scottsdale and Tempe, was launched by Scottsdale Public Art in 2010 as an initiative for temporary installations in vacant storefronts. The initiative has since continued to expand and gain momentum since its inception, increasing its positive impact on our local communities and our Arizona artists. “These types of activities are a part of the larger effort to create a sense of place in Downtown Mesa where neighbors can come together and have pride in their community,” Terry Benelli, executive director of NEDCO, said in the press release. NEDCO is a nonprofit community development financial institution based in Mesa. Primarily offering micro-loans to low-moderate income census tracts, NEDCO also seeks out opportunities to support the local community through economic development, creative placemaking, and real estate development. 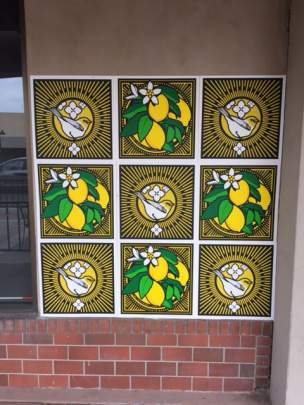 Jake Early, a Tempe resident, graphic designer and illustrator, has been chosen to design and install his art during the Cycle 5 phase of the project in downtown Mesa. Mr. Early’s passion stems from being “drawn to the concept of poster as public megaphone because I believe strongly in public art and its ability to communicate ideas, transform public spaces, and honor local places and people. My goal is to use my art to fill public space with images that reach a broad audience while honoring the local landscape…In my prints I try to communicate what is both familiar and unfamiliar about the places we live and pass through every day.” he said in the release. 12 West – 12 W. Main St.
Asylum Records – 108 W. Main St.
Justice Trax – 1 W. Main St.
LoFi Coffee – 105 W. Main St.
Lulubell Toy Bodega – 128 W. Main St.
Mesa Arts Center – 1 E. Main St.
Muralt’s Custom Jewelers – 228 W. Main St.
Nebula Vaping Lounge – 58 W. Main St.
Queen’s Pizzeria – 125 W. Main St.
Merchants and property owners look forward to implementing more art projects throughout the year and after this project is completed to create vibrancy. For more information about the project, visit the website.